A man and a woman are seated across a table. The man, viewed from his back, holds an open newspaper. The woman holds a beverage mug in her hand. 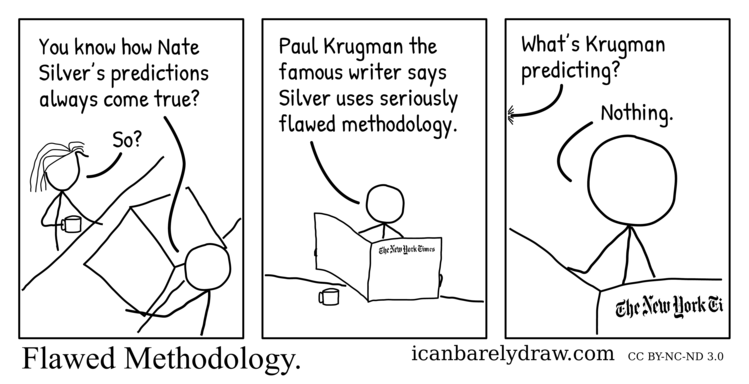 Man: You know how Nate Silver’s predictions always come true? The next panel shows only the man as seen from his front, still seated at the table, and still holding the newspaper, now spread out in his hands. A beverage mug rests on the table. The title of the newspaper reads in a decorative font: The New York Times. Man: Paul Krugman the famous writer says Silver uses seriously flawed methodology. The third and final panel shows only the man, still holding the newspaper, in a closer view. Off-panel voice: What’s Krugman predicting?